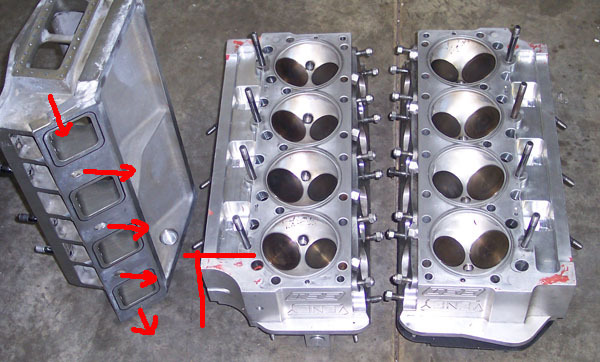 10 Bolt pattern - 1 bolt between each port and 1 bolt on each end ( often the bolt behind the Mag wasn't used or was actually cut off of manifold and/or head) bolt , uses a gasket (stock), some had o-rings on intake manifold. 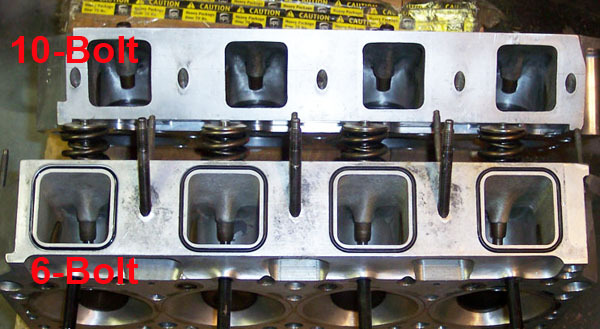 WAR head with 16 bolt (stock) bolt pattern, and 6 bolt pattern. o-rings between the old and new ( not all manifolds would seal properly. Early Veney (FUEL) heads had there own intake bolt pattern "AND" Manifold dimensions, the head intake surface was machined at 90 deg. to the head surface . Alcohol - Fat Heads- Brad Anderson Racing / MBE / Co-Line / NRE / Total Flow ...etc. 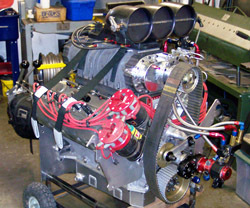 designed for blown alcohol engines and A/Fuel - Unique intake manifold dimensions, fit most Fat Heads except "Veney"
Alcohol - Fat Heads - Ken Veney Ind.